Two posts in one day is I know very rare from moi. However tomorrow I rise at 4am (unless snow falls through out London and curtails travel)Â and so rather than not post thought I would get super organised . I love this time of day dusk isÂ rapildy descending to blackness and the house,Â as I sit in my snug little office is washed with the softest glow from the zillions of lights I have on coupled with the odd scented candle. A fire burns gently in the grate Maud is snoring and all is at one with the world .Â Which got me to thinkingÂ how important it is to have a work space that inspires you to get creative, that you want to linger in until the dead of night, where you follow your dreams and make new plans. 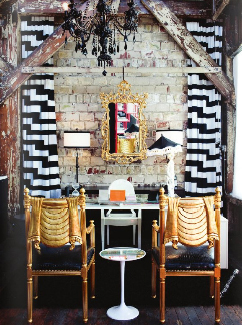 Below is just such a space the creative office space of lifestyleÂ guru Kelly Moore. Exuberant, stimulating and fabulous at the same time. 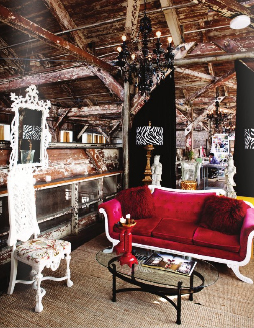 Its a heady mix of high end glamour mixed with in with a rustic vibe. Am pretty sure I could get very creative in this space. Talking of which all day I have been hammering out ideas, sketching (very badly)Â some concepts for our next product range and wanted to turn to you guys for your valued opinions. We are of course expanding our range of animal lights as the response has been amazing but aside from lights I am torn between designing a range of vases or a collection of candle holders. Needless to say they will of course follow our ethos idiosyncratic with a sense of tongue in cheek whimsy. I can’tÂ do bothÂ at the same time as we are working with a very small collective of potters in Stoke on Trent and I don’t want to blast them with stuff nor do I want to outsource to China as I am pretty passionate about producing a collection that is made in England. Stoke on Trent is and has goneÂ through some very tough times, once the centre of pottery production for England its seen far better days and in my own small way want to keep it truging along. Anyway back to my question – a range of beautifully, quirky bold, blingy and fabulous candle holders or vases. I am leaning towards candle holders since I burn candles all the time and find whats out there a bit dull – but then also feel the same way about vases. Decisions, decisions.